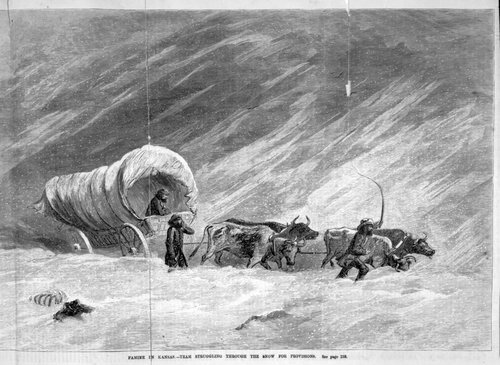 An illustration copied from the New York Illustrated News showing people and a covered wagon pulled by oxen struggling through the snow in search of provisions. Kansas experienced a long period of drought from June, 1859 until November, 1860 and as a result settlers suffered particularly in the rural areas. With failed crops and limited supplies, thousands of people packed up and went back East.